Academy of St. Clare of Assisi: EVEN MORE Stitches in Time! ≈ Comments Off on Academy of St. Clare of Assisi: EVEN MORE Stitches in Time! A number of East Realmers have traveled to this event in the past, and we would love to have another invasion by our embroidery friends from the East again this year. The Kingdom of Æthelmearc is holding its Crown Tournament today, and the Æthelmearc Gazette is providing coverage. The starting tree has been posted, and updates will follow. The Æthelmearc Gazette reports that the new heirs to the Kingdom are Duke Timothy and Duchess Gabrielle. A photo and more information about the other finalists and semi-finalists can be found here. The Æthelmearc Gazette reports that their kingdom has new heirs, Prince Marcus and Princess Margerite. For more information, read the Æthelmearc Gazette article. This article appeared in the Æthelmearc Gazette on 1/17/16, and is reprinted below in its entirety. We interviewed Mistress Alicia Langland and Mistress Antoinette de la Croix. 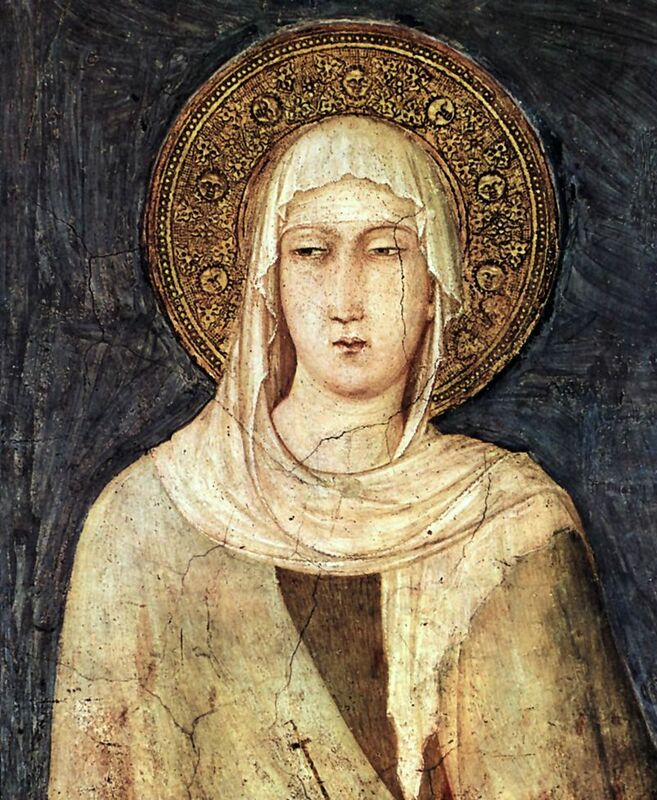 Let’s start with the Obvious – who was St. Clare of Assisi? Alicia: We chose St. Clare of Assisi because she is the patron saint of embroiderers. An embroidered garment made by her for Saint Francis of Assisi is housed at the Convent of St. Clare in Assisi. What prompted the organizers to try an embroidery only event? Alicia: Subject-specific events are wonderful, in my opinion, because they allow attendees to focus on the topic at hand rather than being pulled in different directions. They allow more in-depth teaching than what is generally offered at a schola or university event. We can tell teachers, “You can offer a 3-hour intensive class, and people WILL come!” This helped us entice teachers from other Kingdoms to come and share their expertise. An embroidery-only event allows us to bring together people who enjoy this art form and who want to delve deeper into the techniques and tools. Because it is a weekend-long event, we can offer intensive hands-on classes that allow lots of time for the instructors to work with and guide their students. Another plus will be having ample time to get to know each other, to swap tips and techniques, and to build a sense of community. We would love to see this become an annual event. Antionette: A dear friend and I have been discussing this as a concept for at least a year. 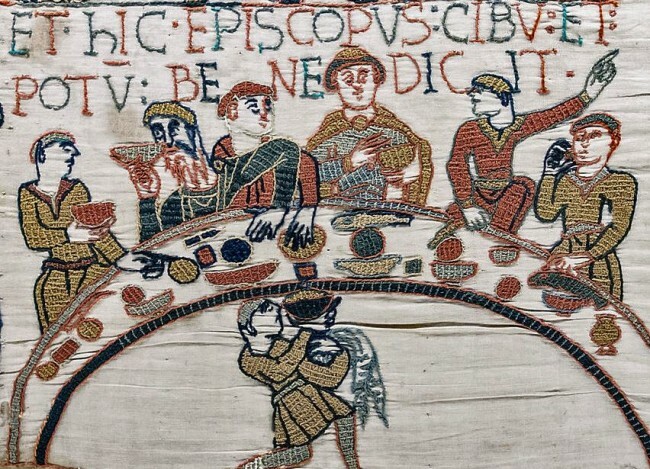 Given the increased interest in embroidery we wondered if there were enough interested gentles to create an active embroidery community within Æthelmearc that would be inclined to attend an embroidery specific event. The idea of getting the majority of embroiderers within our Kingdom in one place, talking about embroidery and sharing their stories is an exciting prospect! I have seen many introductory specialized needlework classes offered over the years but for the intermediate and advanced embroiderers there is less on the menu, so to speak. There are far fewer truly intensive classes offered outside of Pennsic. By offering how- to and longer classes within a set structure with instructor support, and with room for creativity and individualism, students are given the opportunity to create some extraordinary accessories. Research and documentation is also an area that we will address; everybody researches, however documenting can seem like the scary monster under your bed at night. By flipping on the lights we hope to reveal that the monster is actually a rolled up sock; we wish to foster less fear and more confidence by addressing documentation in a user friendly manner at this event. How have you seen the needlework arts change in your time in the SCA? Do you think we are holding people to higher standards now that sources are more readily available? Is this a good thing? Antoinette: Our path to knowledge has exploded with the internet and all the arts within the SCA have been affected over my last 17 years as a Scadian. On a rainy Sunday afternoon I can visit the London Library, the Getty in California and The Heritage in Russia and cap it with a visit to the Cluny- all from the comfort of my home. Frankly, I like to think of it as a Golden Age of Enlightenment for all of us. 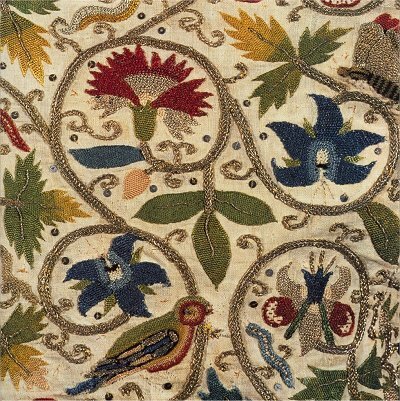 During my early years as a Scadian, I recall lovely embroidered wool coats with large zoomorphic patterns and exquisite late period Elizabethian and Renaissance styled embroidered items but they were far and few between. I must admit that I felt a little overwhelmed when I considered the scale of such a daunting undertaking. For me embellishment was a gradual process over a 10 year period: it began with a little stem stitching, a few beads, some pearls, even more pearls, embellishing trim to original design based on extant items, information garnered from statuary, paintings, illuminated manuscripts, funerary art and so on. Once you understand the standard canon, each piece of garb is a blank canvas for you to embellish and make your own, unique piece of art. Standards creep does exist, but it is wise to remember that we all start at the same place, the beginning and this is not a race; we will all get to the finish line in our own time. As an artist, I want to be a positive force and an encourager. I don’t believe standards creep is an excuse to be negative, we are all here to help each other grow. Alicia: The activity level in needle arts has waxed and waned as enthusiastic people come in, get active, and then take a break to pursue other interests. Overall, though, there has been a general trend toward a broader array of historic needle crafts. This arises from the increased number of source being published in books and on the Internet. You generally see a bump in needle arts when a major work on historic embroidery appears. Look for one later this year when the Victoria and Albert Museum holds its new Opus Anglicanum exhibit. Are we holding people to higher standards now? No and yes. The single continuous standard I’ve known is “are gentles drawing inspiration from historic sources”. As more sources become available, it becomes easier to find sources. Yet some people stall at the idea of research and documentation. They don’t understand that research can be as simple as a Google search and that documentation is just writing up all the cool stuff you found during that search. That’s one of the things we want to talk about at The Academy of St. Clare: how easy research and documentation can be. What can we do to encourage newer participants to get started with needlework projects? Alicia: Hosting “Stitching Solars”: a quiet corner where embroiderers can gather at events and sit and work on projects would be a terrific way to pull people in. Lots of folks who wouldn’t consider attending a one- or two-hour embroidery class might be more likely to drop by and check out what’s going on. Small projects for the Kingdom, such as last Pennsic’s embroidered favors for Queen Gabrielle, are another way to pull people in. Posting clear instructions with photographs of each step on the Kingdom website and in the Gazette was a brilliant idea. I would love to see more embroidered pieces entered in displays. The more folks see how much better garments look with even a bit of simple embroidery, the more others are likely to pick up a needle and hoop. Seeing other ways to use embroidery than just to embellish clothing would be inspiring, too. Antoinette: The best way to encourage budding newish embroiderers is to provide them with what they need to achieve their own goals and this will only happen through conversation and community. More structured Embroidery circles at events and non-events for folks to show up, catch up, stitch together, and share their recent triumphs and tragedies. 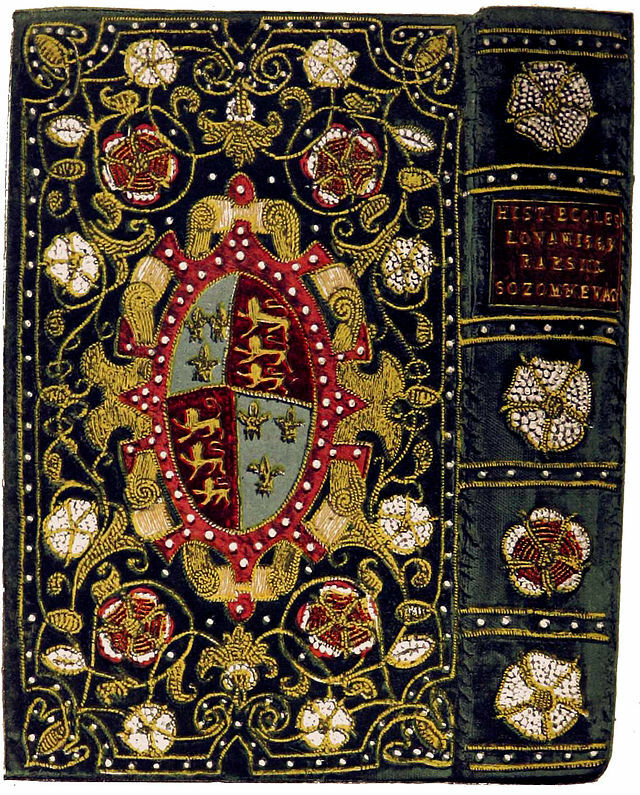 What are some online places to gather for Æthelmearcians interested in needlework? Alicia: Embroidery for SCAdians on Facebook has nearly 700 “likes.” It’s a great way to get inspiration, help with a project, or news about sources and resources. Fun Fact: “Embroidery for SCAdians” was started 3 years ago by an Æthelmearc embroideress who wanted a way to reach out to other embroiderers. Antoinette: There are several places on FB; I see some amazing items posted on the wall of the Facebook page mentioned above. BMDL has a fiber arts group that gathers to share knowledge and spend time together Honestly, I prefer face time with others as my community building activity of choice: good coffee, pastry, good company; that’s where it’s at. What is your favorite hard copy resource? Antoinette: I could no more pick a favorite needle arts book than I could pick a favorite daughter! My go to series for any new technique I wish to learn are the Royal School of Needlework series. Beyond this I have spent the better part of my adult life studying paintings, sculpture including funerary art, stained glass windows and illuminated manuscripts. I also have a small leather sketchbook that I take to museums wherein I sketch designs I see painted on clothing within portraits and sacred paintings within the medieval period. I also study ornamental architectural elements and lately medieval tile floors for inspiration. This adds to my standardized canon on design motifs and patterns that were used and which increases my arsenal for designing my own work later. Tell us a little about yourself and your involvement with needlework/favorite medium. Alicia: I have done some embroidery (I learned to do stem stitch so I could embroider my husband’s tunic for his elevation to the Laurel. That was … over 15 years ago! ), and I find it very relaxing. But I don’t really consider myself an embroiderer … yet. Antoinette: I am a life-long embroiderer and I love gold and pearls and more pearls and even more pearls. My mother taught me to embroider when I was a little girl and she believed in excellence in all things- so I learned at a young age to always give my best possible effort in whatever I endeavored to do. I find it also prevents scribal burn out for me, I flip back and forth between needle arts and scribal arts. Embroidering is equally relaxing and exciting so to me it is the best of both worlds! Is the event in garb? Alicia: Yes, please! What better way to show others embroidery in use? We also want gentles to bring more embroidery than they can wear to stock the display area. Alicia: One thing that might be worth mentioning is the two-step registration process for this event, as this might be somewhat confusing. For most schola or university events, students sign up for classes with limits the morning of the class and pay the instructor at the start of the class. But we didn’t want instructors to break their banks buying supplies for their classes, not knowing whether or not they would be able to recoup their expenses. So we are asking students to pre-register for the event first. When your event registration has been received, you will receive an email with information about how to register for your afternoon class with the Class Coordinator. Payment for the kits must be received by the Class Coordinator on or before February 12, 2016; this will give the instructors sufficient time to acquire the materials and assemble the required number of kits. Compared to most SCAdian class fees, the cost of the kits is higher than what most folks are accustomed to. But when you read the kits’ contents, you’ll see why: Kits contain high-quality supplies and period materials such as linen, silk, and wool. To replicate a kit’s contents, you would have to pay far more than what is being charged for the kit. Consider the event a gift you give yourself! Have a hard-to-shop-for friend who loves to embroider? Paying your friend’s event registration and/or kit fee would make a wonderful present! Despite this being a small event, it has an inter-kingdom faculty. Teachers are coming from AEthelmearc and the East. We also expect attendees from Atlantia. (The event is listed on the calendars of 5 Kingdoms!) The Academy of St. Clare will be a great place to meet embroiderers from all over the Kingdom and the eastern seaboard. Do you love to embroider? Does the idea of stitching with friends fill you with joy? Ever wish for an embroidery class that offers more than basics? If so, then clear your calendar because the Shire of Abhainn Ciach Ghlais is opening its doors to embroiderers and stitchers from all over. The Academy of St. Clare of Assisi: Stitches in Time is an event for embroiderers, by embroiderers and about embroidery. It offers a keynote address about medieval embroidery, small specialized classes on single topics, long detailed classes on beloved styles, and a chance for embroiderers to form the community that we’ve been waiting for. This Embroidery Extravaganza will be held at Boy Scout Camp Karoondinha, 225 Thomas Dam Road, Millmont PA 17845-9448 (GPS Coordinates: 40.85630, -77.2547) Site opens at 5 PM on Friday, March 11, and closes at 11 AM on Sunday, March 13. NOTE: The site is a Boy Scout Camp located on the side of a mountain, and the roads and paths are gravel, not paved. This can make getting about difficult. Some walking will be required, as the two buildings we will be using are not near each other. If you have mobility concerns, please request a parking placard when you send in your reservation. Cell phone service at the site can be spotty, depending on one’s carrier. Each “Kit” class is 3 hours long and will be limited to a small number of students. Kits will contain specialty supplies and period materials needed to complete the class project. (Kit classes may require more equipment; if needed, you will be notified of additional items to bring after you have pre-registered.) Details about the kits can be found on the event website. What’s in Your Toolbox? A roundtable discussion about favorite tools and suppliers. Embroidery Display Area: Display your work, for feedback & inspiration. Breakfast / Research and documentation can help you take your work to the next level. Two Laurels will share their know-how over breakfast. Bring scissors, an embroidery hoop, and (if possible) your favorite lamp/lighting device with extension cords. In addition, please bring items for the Embroidery Display and to share during Show-n-Tell. We invite all attending to bring relevant books from their personal libraries to contribute to an event reference library. The library will be staffed, and books will not leave the library area. Please DO NOT bring alcohol, as the Boy Scouts have a strict no alcohol policy for those who use the camp. Nor do they permit pets on site or smoking in any of the buildings. Do not jeopardize our future use of the site by violating their policies. If we find that you have alcohol, you will be asked to leave the site with no refund. The cost for the weekend – which includes lodging in a heated cabin as well as breakfast, lunch, and supper on Saturday and breakfast on Sunday – is $25. Those without proof of current Society membership must pay the $5 non-member surcharge at the door. Event reservations must be postmarked on or before Saturday, February 20, 2016. Make checks payable to “SCA PA, Inc. Shire of ACG”. Along with your SCA and modern names, please include your email address so we can confirm receipt of your reservation. Include any food allergies with your reservation. If you have mobility concerns, request a parking placard to place in your vehicle after you check in. Upon receipt of your event reservation, we will send you details for pre-registering for the “Kit” classes. Because each “Kit” class will be limited to a small number of students, pre-registration is required. Students must pre-pay for their class kit; class rosters will be filled based on the order in which payment is received. To give the instructors sufficient time to acquire the materials and assemble the required number of kits, payment for the kits must be received by the Class Coordinator on or before February 12, 2016. Because the site requires us to pay the rental fee in full well before the event, we must ask our guests to reserve in advance. If you request a refund of your event registration prior to March 1, we will refund your event fee. On or after March 1, we can only refund your event fee if we have sufficient attendees to break even. If you have paid for a kit, we will refund the cost of the kit if we are able to re-sell it. If we cannot re-sell your kit, we will mail it to you after the event. The heated sleeping cabin (Edna Sheary Lodge) is accessible to those with mobility restrictions and has indoor bathrooms with bathroom with showers, toilets, sinks, and electricity. The cabin also has a kitchenette and a meeting room. There are 32 individual cots (with mattresses) in 2 sleeping areas. Overnight guests should bring bedding (pillow, sleeping bag/sheets and blankets) and towels. If you arrive on Friday night, drive to the Sheary Lodge to unload your gear. Parking spaces in front of the cabin will be reserved for those with mobility concerns. If you arrive on Saturday, drive to the Dining Hall and check in. Parking spaces closest to the Dining Hall will be reserved for those with mobility concerns. Merchants, please contact the Autocrat for details about space. The Head Cook is TBA. According to Google maps, we’re about 4.5 hours (or less) from almost everywhere! Abhainn Ciach Ghlais is truly the heart of Æthelmearc! Guests coming from the East or West will probably travel on Route 80 to Route 15 to Route 45 to Route 235. Guests coming from the North will probably travel on Route 15. From State College: Find your best route to Route 45 East. Follow Route 45 East through the Hairy Johns State Forest. Just past the Laurelton State School (there will be many large stone buildings and well-kept ground on the left), turn right onto Route 235 South. Follow from ** below. From the East, North, and parts farther west: Find your best route to Route I-80. Take Exit 210 A, Route 15 South, to Lewisburg. Stay on Route 15 S for about 7 miles; you will come to the intersection of Routes 15 and 45 at a light. Turn right onto Route 45 West. Continue from the * below. From the South: Find your best route to Route 15 North. In Lewisburg, you will come to the intersection of Routes 15 and 45 at a light. Turn left onto Route 45 West. Continue from the * below. * Proceed west on Route 45 West for about 17 miles, passing through the towns of Mifflinburg and Hartleton (follow speed limits here). At the intersection of Route 235 South, turn left. ** From this turn, follow signs for 235 South for approximately 3 miles through Laurelton (last chance for food, gas, and ATM) and Glen Iron. The road makes several 90-degree turns; just before the last one, you will pass the West End Fire Company on your left. Turn right onto Creek Road at the 4-way intersection past this last 90-degree turn. Penns Creek should be on your left. Stay on this road for approximately three miles; you will pass a large 3 story stone house with three arches, on your right, at this point you are about one mile from the Camp. After you cross the bridge over Penns Creek, Penns Creek Campground will be on your right –turn right at the sign for Thomas Dam Road/Boy Scout Camp. Drivers are asked to use their flashers and to travel at the posted 10 miles per hour.